Commissioned ceramics and pottery by Paul Gould at Mon Ceramics. Very Proud of the work done by students and staff at St. Martin’s Academy, Chester. Each student and staff member made a poppy to commemorate the 100th year anniversary of the ending of the First World War. Each poppy was marked with the name of one of the fallen servicemen from Chester. The intalled poppies are on view at the school, in Hoole, Chester untill late November. They are cascading over the school ‘war horse’. Lovely work done bypupils of Haytfield School, Upton, in a series of workshops. 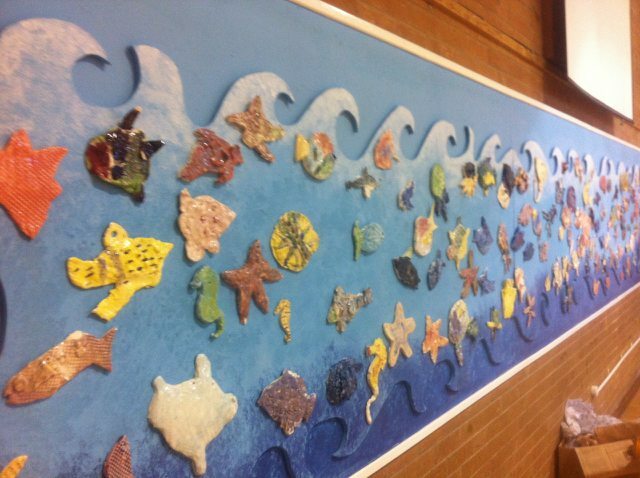 Splendid collection of sea creatures made by students at Hayfield School, Upton. They came to me at the studio and made them in a series of sessions that accommodated every pupil of the school.